Chris Herring Heat & Air is proud to serve the New Albany community! About New Albany, MS - Happy to be your hometown Heating & Air Conditioning Contractor! New Albany, Mississippi is a Union County city with a population of over 8,500 residents. It is the county seat, and it was originally organized in 1840 as the site of a saw and grist mill along the Tallahatchie River. Today, the community is well known for its strong work ethic and top-notch education system, and a satellite campus with Northwest Mississippi Community College allows residents to continue their education here. New Albany also earns a claim to fame as being the birthplace of Nobel Prize winning author William Faulkner. 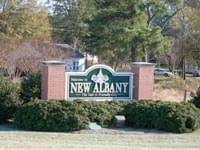 New Albany is home to several interesting area attractions. The Tanglefoot Trail is the longest Rails to Trails conversion in the state, and it features 44 miles of hiking and biking trails. The region also features the Ingomar Indian Mounds, a burial complex that was formed between 100 B.C. and 400 A.D. and was first excavated in 1885. Families with children often enjoy a trip to the nearby Wolf Howl Animal Preserve, where visitors can view wolves and their pups while learning about behaviors, habitat, and more. Historic Downtown New Albany is also a thriving area within the community. This portion of the city includes restaurants, antique shops, specialty stores, parks, and more. Tallahatchie Gourmet is one of the most popular lunch restaurants, and a variety of sandwiches are available at Nichol’s Deli. Sugaree’s Bakery also offers a variety of old-fashioned southern recipes that both visitors and residents will enjoy. New Albany is part of a humid subtropical climate zone. Weather conditions will vary dramatically throughout the year in order to form four distinct seasons. Summer temperatures are influenced by Texas and the Gulf of Mexico, creating hot and humid conditions. Alternatively, winters are chilly to mild, with daily highs in the low 40s. These varied conditions will require residents to invest in both home heating and cooling systems to stay comfortable and safe.